The Brewster SB2A Buccaneer was a single-engined mid-wing monoplane scout/bomber aircraft built for the United States Navy during the early 1940s. It was also supplied to the United States Army Air Corps. The SB2A (Brewster Model 340) was a development of Brewster's earlier SBA scout-bomber, sharing the single-engined, mid-winged monoplane layout of the earlier aircraft, but was larger and had a more powerful engine. It carried up to 1,000 lb (454 kg) of bombs in an internal bomb-bay and for defensive purposes was fitted with a power operated turret armed with two .30 in machine guns supplementing a further four forward firing guns. 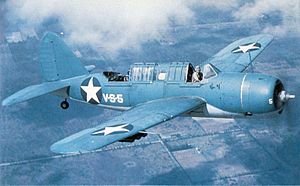 The US Navy ordered a prototype XSB2A on 4 April 1939, which first flew on 17 June 1941. Large scale orders had already been placed by this time, however, with the United Kingdom ordering 750 aircraft as the Brewster Bermuda and the Netherlands ordering a further 162 to equip the Royal Netherlands East Indies Army Air Force. The first US Navy production order, for 140 aircraft, was placed on 24 December 1940. The Royal Air Force purchased a version based on the SB2A-1s which they designated the Bermuda. They were used for training and target towing. Five of the Cyclone powered aircraft under the model number '340' were supplied to the Fleet Air Arm of the Royal Navy for assessment. (Model 340-7) Prototype, one built. (Model 340-20)Initial production, revised armament - non-folding wings. 80 built. (Model 340-26) Fitted with folding wings and arrestor hook for carrier operations. 60 built. (Model 340-17) Requisitioned aircraft built for Netherlands. 162 built. Designation for an intended Lend Lease production for United Kingdom but none were built. Model 340-14 production for United Kingdom. Turret replaced by flexible gun mounting. Originally 750 ordered, but only 468 were delivered. United States Army Air Force designation for Bermuda I aircraft not delivered to the United Kingdom and used as ground training airframes. Royal Canadian Air Force three Bermuda Is used for trials then used as ground instructional airframes. Picture - The SB2A of the National Museum of Naval Aviation. A-34 Bermuda (s/n 462-860) has been restored by the National Museum of Naval Aviation at Naval Air Station Pensacola, Florida. It is displayed as a US Navy SB2A Buccaneer. Another Bermuda (s/n unknown) is in storage at Pima Air and Space Museum in Tucson, Arizona. Donald, David (editor). American Warplanes of World War II. London: Aerospace,1995. ISBN 1-874023-72-7. March, Daniel J.(editor). British Warplanes of World War II. London: Aerospace,1998. ISBN 1-874023-92-1. Swanborough, Gordon and Bowers, Peter M. United States Navy Aircraft since 1911. London:Putnam, Second edition 1976. ISBN 0-370-10054-9.